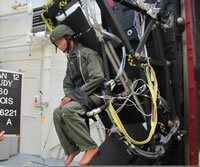 Wolf has developed a crashworthy stowable troop seat program for multiple Air Force contracts. Large Special Operations or Search & Rescue Helicopters are required to perform a variety of missions. The seats used to carry troops in these aircraft provide limited protection to the occupants as they do not adequately attenuate the energy during a crash pulse or restrain the crewmember during impact and roll-over events. The seats themselves do not provide a clear path for crewmember movement during flight. Wolf has developed a passive energy absorbing (EA) technology that increases the time over which crash energy is transmitted to the seat structure, which reduces the g-loading on the warfighter’s body. 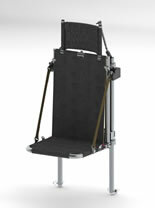 Crashworthy, light-weight, and movable/stowable seating is required that allows safe transportation, rapid egress/ingress, and stowing of the seats as necessary to allow for changing mission needs. 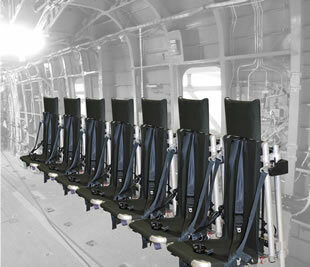 Wolf’s Troop Seat design will protect troops in crash environments up to the 30g to 50g range. This new technology also allows for a seat design of much lighter materials. Wolf has also considered the comfort of the seat and has made small changes to the standard seat structure to allow the warfighter to be more comfortable. Wolf’s design is lighter weight, safer, and more comfortable than other troop seat designs. Crew members need to be able to quickly get into their seats, strap in, stay there until they reach their destination, and then be able to quickly leave their seats and leave the aircraft.